Having been so fortunate that the width on site fits five 40 cm Billy bookcases (ie the span is over 200 cm wide) the height of the bookcases had to be adjusted so that the base of the free floating Billy extensions would later be slightly above the level of the passage. A height of 208 cm was required as the Billy’s are 202 cm tall, the floor had to be doubled by 6 cm. Much more than the 6 cm would have been hard to hide with a base or would kill the overall picture of the construction. 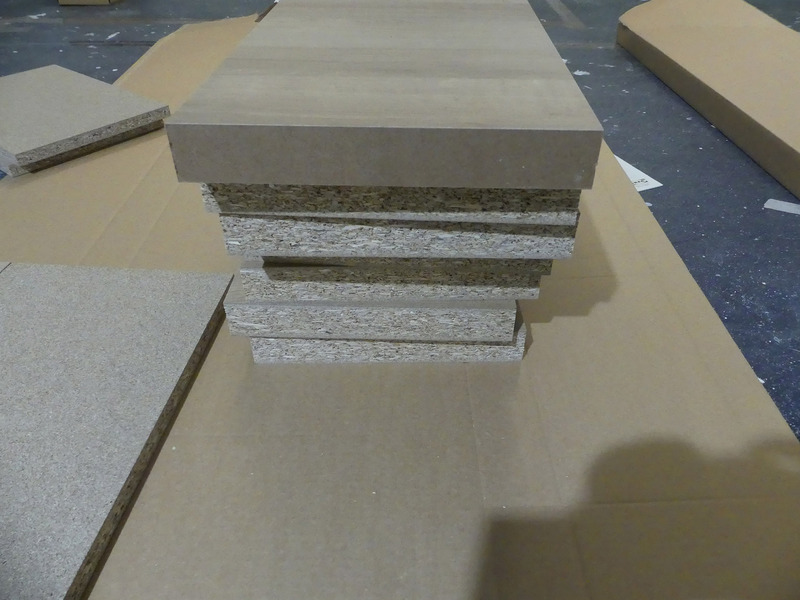 The cutting departments of DIY stores sometimes have remnants of kitchen countertops or other boards which they cut for small money. 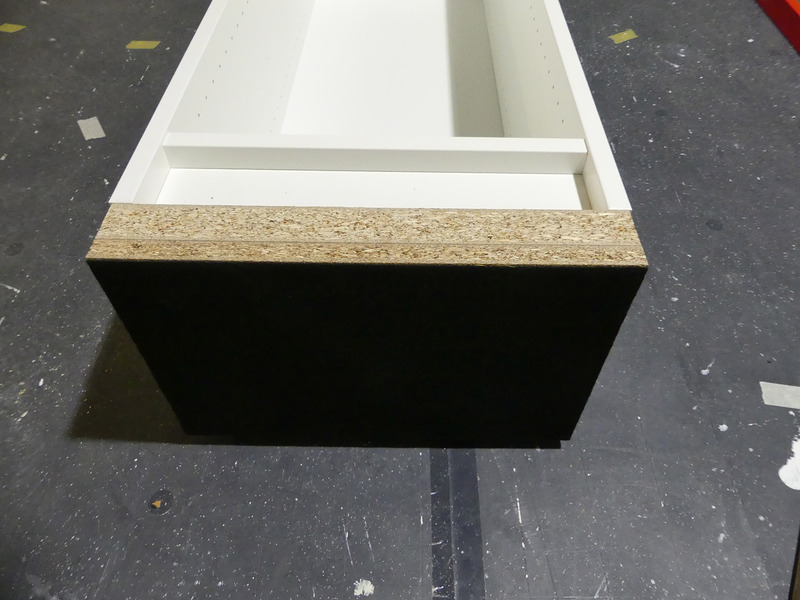 I opted for a 40mm kitchen worktop and a 20mm chipboard to double the base of the Billy bookcases. 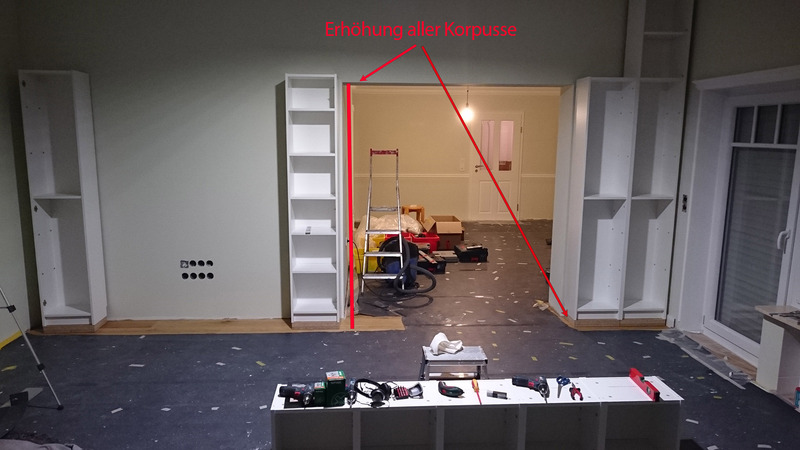 Important: The plate dimensions has to be about 2 mm smaller than the respective bookcase dimensions because a later overhang of the plates would be very bad (and not rely on Ikea measurements – always measure yourself!). The plates are thus easily screwed on the underside of the Billy bookcases. 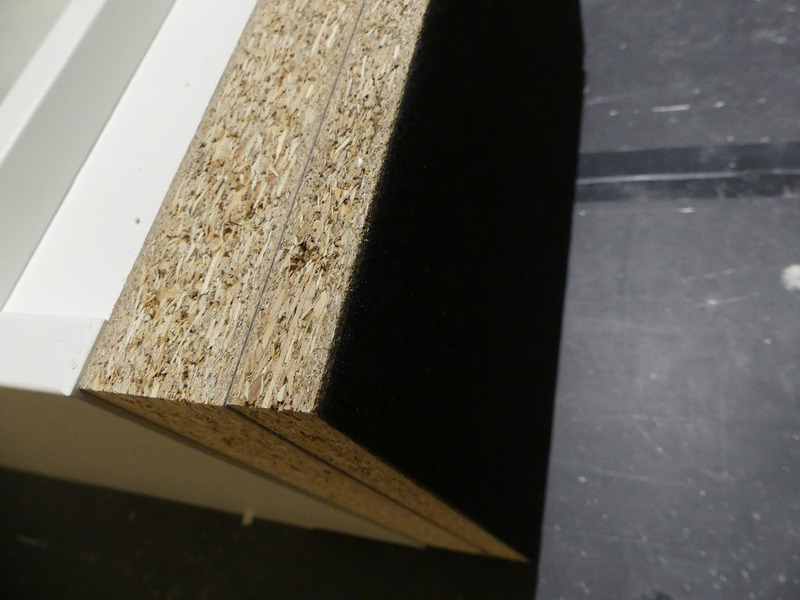 In order to protect the parquet and to be able to move the shelves at least during the construction phase (important), a self-adhesive very stable vehicle adhesive felt was glued to the bottom plates of the bookcases. 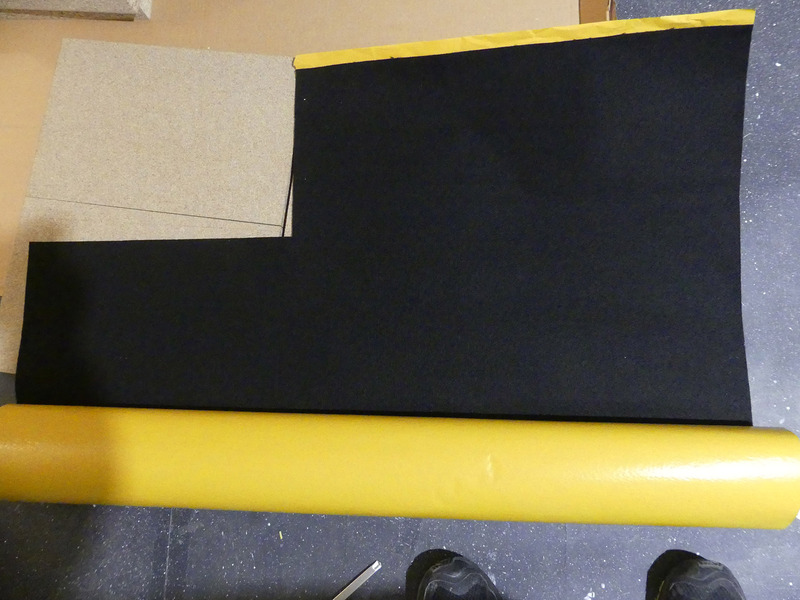 The automotive adhesive felt is supplied on rolls and relatively inexpensive to get. The advantage is that it can be easily cut to the required size and sticks very well. 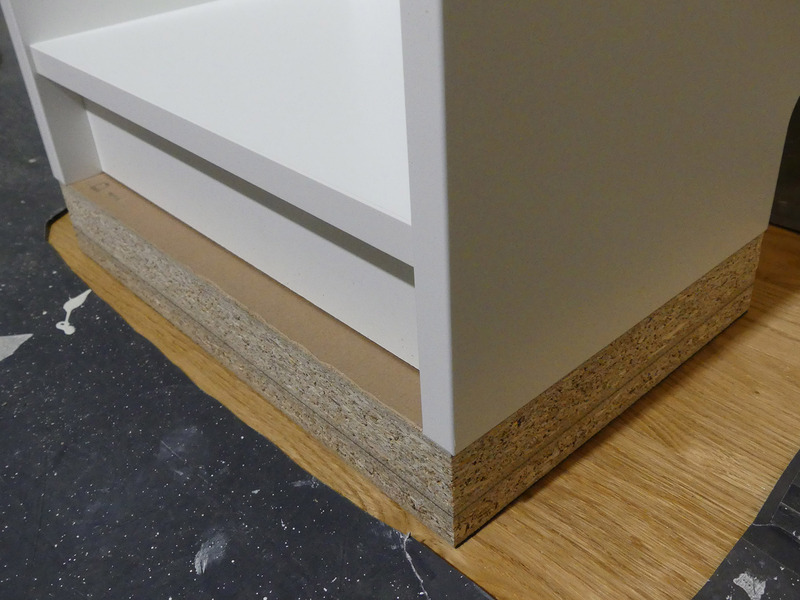 In a later construction phase the elevated base will be clad with a classic 140 mm skirting board.